For this year’s April A-Z Challenge I am blogging a series of sketches about the free people formerly enslaved on the Cleage plantations in Athens, Tennessee. Click on any image to enlarge. As I was researching Abraham and Amanda Cleage who started in Athens, TN and went to Austin, TX and on to Los Angeles, CA, I came across another Abram and Amanda in Little Rock Arkansas. I first found Amanda and her card from the Freedman’s Bank in Little Rock. This was the first and only such card I have come across. Below is her story as I pieced it together. Amanda’s Freeman’s bank card on the left. On the right is the card of the woman she worked for. 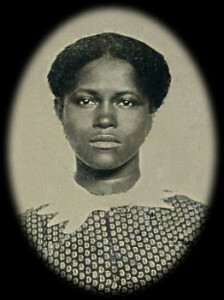 Amanda was born into slavery about 1858 on the plantation of Thomas Watts Clegg in Jefferson County Arkansas. She was the daughter of Abram and Fanny Clegg. There were a total of twelve slaves and two slave dwellings. 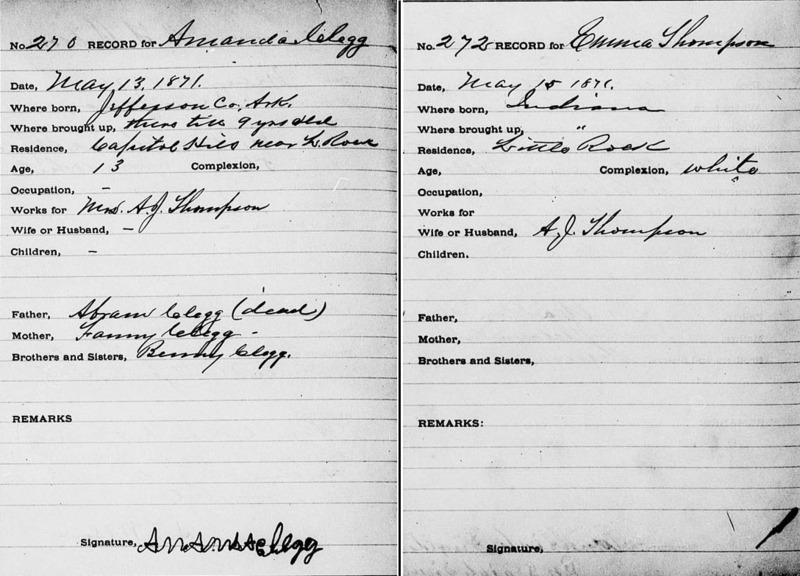 Amanda’s younger brother Benjamin was born in 1867. Her father, Abram, died soon after Benjamin’s birth. The family lived in Jefferson County until Amanda was nine years old when they moved to Little Rock, Arkansas. In the 1870 census, Fanny said she was born in Tennessee. Fanny worked as a cook while Amanda worked as a servant. She opened an account with the Freedman’s Bank in 1871 and was able to sign her own name. I hope she did not lose much money when the bank failed in 1874. Benjamin married and had a son, Benjamin Jr., who was born in 1892 in Arkansas. Amanda married a Mr. Love in Arkansas. both of these marriages ended, due to death or divorce. Their mother Fanny died before the move to Kansas City, Missouri. In 1893 twenty five year old Amanda married Hezekiah Powell, age forty three, in Kansas City. Benjamin joined them and shared their home through the years while working as a porter and later a bootblack. Hezekiah owned and operated restaurants and hotels through 1911. Amanda worked as housekeeper, cook and laundress. She gave birth to one child who died young. Around 1912 Hezekiah went into the shoeshine business, where he continued for the next 28 years. Benjamin worked as a boot black in his brother-in-law’s business. Amanda worked off and on as a servant or maid. On January 2, 1929 Benjamin died in an automobile accident that resulted in a fractured skull. Amanda was the informant on the death certificate. She reported that he was married, that his parents were Abram Clegg and Fanny Clegg, and that Fanny was born in Tennessee. Benjamin was 62 years old. On September 28, 1932, Hezekiah died when he fell asleep while smoking and set himself on fire. Once again, Amanda was the informant on the death certificate. He was born in South Carolina. She did not know who his parents were. Hezekiah was 82 years old. On December 20, 1936, Amanda died of heart problems. The informant was Pearl Smith from Chicago and she did not know the names of Amanda’s parents. Amanda was 78 years old. I hope the living of their lives was not as hard and sad as the reading about them was. Were they were tied to my Athens, TN Cleages. I think they were not. Another question that came up was, if the Amanda who married Hezekiah was Amanda Clegg because she was listed on the marriage record as Amanda Love. I was unable to find a marriage record for Amanda and Mr. Love but, she said on the 1900 census that this was her 2nd marriage and after comparing all the addresses for Benjamin and the Powell’s over the years and finding that they lived together so much of the time I concluded that she was Amanda Clegg. Finding Benjamin’s death certificate with Amanda as the informant sealed the case for me. So many of your stories are sad and heartbreaking. At least MY stories are made up. When I found those very sad death certificates yesterday after a long, too long, search around the internet, I exclaimed aloud (just like a character in a book). Poor Hezekiah especially, after being reduced from restaurant owner to shoeshiner and then to burn himself up in bed. Just too sad. So did I Eli! There turned out to be so much there when I thought at first there was not much.